You are currently browsing articles tagged Cuba. We got on the ferry and the boat pulled away from Casa Blanca. I don’t know what you imagine a ferry boat to be like but I’m sure this one was nothing like what you’d imagine. It was really like a floating subway car without any seats on it. It was boxy and made of metal and very hot inside. You got on the boat and everyone quickly maneuvered to get near one of the open windows to catch the breeze. I went to the end of the boat facing Havana so I could look out the window across the water. A young woman and her son did the same. The boy looked a little ill, perhaps just from the heat, so I made room for him so his mother could bring his face to the window and fan him with her hand. The boy stayed very close to his mother but was quite curious about me. He would look at my face and then down at the camera slung around my neck. I smiled at him and asked him what his name was. He looked at his mother and she nodded and he said, “Miguel.” I told him my name. I asked him if he spoke English. Again he looked at his mother. His mother said he didn’t but she did, a little bit. I asked her if it would be okay if her son used my camera to take a couple of photos. She said yes and then shooed him over to me. I handed the boy my camera, showed him where the shutter button was and how to hold it, and told him to take some photos of his mother. He shot one and I showed him how to look at it on the LCD screen on the back of the camera. He smiled, his eyes getting big. Then he took the camera and shot several more photos of his mother. We looked at them together and he picked out the one he liked best and then he took the camera over to his mother and showed her the photos he had taken. She smiled. She was a pretty woman with reddish brown hair and a pink top and large sunglasses. She seemed very protective of her son. I asked her if I could take a photo of the two of them together and she nodded. After I took the pictures, the boy came over to look at them. He really liked one in particular, a shot where he is half in shade and his mom has an arm draped across his chest. I asked the mom if she got e-mail or had a way to get the photo if I sent it to her. She said no. I asked her if she had a relative or someone in a work place that could get it. “It’s not possible,” she said, looking down, and I didn’t know if she meant it wasn’t possible because she didn’t have any access to a computer or because it would be bad to get this photo from an American. I felt bad about it. It was a nice photo and obviously the mom and the boy were very close and I would have liked for them to have this memory of our ferry crossing from Casa Blanca to Havana, but as she said, it was not possible. The ferry boat pulled up to the harbor and everyone hurried to get off. The boy and his mom got off ahead of me. I watched them cross the busy Avenue del Puerto, dodging the fast-moving traffic, and walk quickly up the street, the young woman always with one arm on the boy to guide him. Near the Hotel Valencia, the boy turned his head to look back. I gave him a short wave and he waved back. Then they disappeared up a side street and I did not see them again. At the Plaza de Armas, we caught a taxi back to the hotel. I went for a swim and watched the sun set over Havana and then I went back to my room to shower and change for dinner. It was our last night in Havana. Tomorrow morning we would take a taxi to the airport and by noon or so we’d be back in Cancun. The Cuba trip was over. 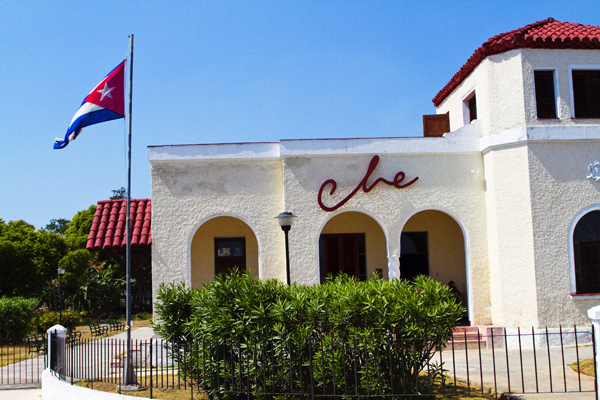 The very modest Che museum in Casa Blanca. Photo by David Lansing. We hadn’t ordered lunch yet at La Terraza because we were still waiting for Greg. We were enjoying the Cuban music and the cold Cristal beers and the sea breeze coming in from the bay and there was no hurry about anything. But then our driver, who had been sitting in the Impala beneath the shade of a thin tree by the plaza, came into the restaurant and respectfully told us that he could not stay any longer. He reminded us that he had told us when we rented the car that he had to be back in Havana by three and since it was now after two-thirty, he had to go. He was sorry. It was not something he liked to do, but there it was. So we paid him the money we owed him, giving him a generous tip to let him know there were no hard feelings on our part, and went back to our lunch. At this point we weren’t sure if Greg was going to join us or not so we went ahead and ordered, getting a couple of dishes we could pass around, like the seafood paella and an octopus dish, plus some shrimp. Just as our food was being served, Greg came in. He pointed at one of the dishes, not bothering with the menu, and asked the waiter for the same thing. It was a very pleasant afternoon. As we were paying our bill, we asked the waiter to call a taxi for us. He said it would be a few minutes. When it came, it was a small car, not nearly big enough for all six of us. Hardy asked the waiter to get us another taxi but he said this one was the only one available. So we decided that I would go with Cam and Nick and then the taxi driver would come back to the restaurant to pick up the rest of the group. We were headed for Casa Blanca, the little village on the other side of the Bay of Havana known for its 60-foot-tall marble statue of Christ and for the Che museum. The taxi driver dropped us off near the Christ statue and we walked down the hill to the Che museum. There is very little to say about the Che museum because there is very little in the Che museum. Almost everything in it, from his bedroom scene to his office, is reproductions of furniture and material from old photos. He was a dentist so one display case has “dentist tools of the period.” Not Che’s tools, mind you, but just some nasty looking pliers and probes from the 50s. We went through the whole house in about ten minutes and then we sat on the tiled roof of the museum, looking out over the harbor and across the water to Havana Viejo, waiting for the others to arrive. They too went through the museum quickly and then we took a few photos in front of the Christ statue before walking down the hill towards Casa Blanca. There were some kids playing soccer in a playground next to a church. When they saw us walking by, several of the younger kids ran over, their hands out, asking us for candy or gum. We didn’t have anything to give them. They followed us for a little while, like stray dogs, before turning around and running back up the hill. At the bottom of the hill was a small ferry building. The guards checked our bags and let us pass through. We sat in the humid dark hallway with about half a dozen other travelers, all locals, waiting for the ferry to come back from Havana. It was so hot and humid in the ferry building that all I could think about was getting back to the hotel and taking a swim in the rooftop pool. We had talked of maybe walking back to the hotel through old Havana but that was before going to Cojimar and the Che museum and walking down the hill to Casa Blanca. Now everyone was tired and hot and just wanted to go back to the hotel. It had been a very long afternoon. As I mentioned yesterday, Cam is a pretty damn fine musician. In fact, he’s just recently cut his first CD, “The Grace and the Grit” (which you can hear samples from by going here). Anyway, we walked along the waterfront back to La Terraza, the very cool little restaurant that was one of Hemingway’s favorites and where he often went in the afternoon to buy a round of beers for the fishermen in exchange for them telling him stories about their adventures out on the ocean. It was from one of these tales (or perhaps a combination of several) that Hemingway got the idea for The Old Man and the Sea, the book generally recognized for bringing the Nobel Prize in Literature to Hemingway in 1954. Hem was at Finca La Vigía when he learned that he’d won the Nobel, which he’d long coveted. 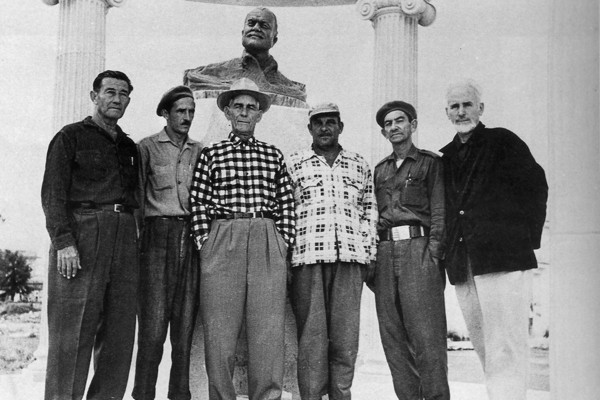 “This prize belongs to Cuba, since my works were created and conceived in Cuba, with the inhabitants of Cojimar, of which I am a citizen,” Hemingway said when he placed the medal at the foot of the Madonna del Cobre near Santiago de Cuba. We walked in to La Terraza and in the bar was a son band playing to a group of Scandinavian tourists. We sat in the back by an open window that faced the harbor so we could catch the fresh breeze. As we were ordering a round of Cristals, the son band came into the back room and started playing. I could see that Cam was particularly fascinated by the lead singer who was playing an instrument he’d never seen before. He asked me if I knew what it was. I told him it was a tres guitar, so named became it uses three pairs of strings instead of the usual six. When the band stopped playing, we called the leader over and asked if we could look at his tres. He was happy to show it off. He handed it to Cam who tried to pick a few chords. The guitarist took the guitar back and showed him how to play it. Cam studied him intently. For the rest of the story, you really need to just watch the video as I captured the scene live. I figure that some day when Cam is the next Eric Clapton, this video will be famous. From the fort at Cojímar we walked over to a little plaza across the street where there is a bust of Hemingway which is a copy of the one at the El Floridita in Havana where, back in the 1930s, Hem supposedly helped the bartender, Constante Ribalaigua, perfect the daiquiri (I’m talking about the real thing, made with white rum, lemon juice, sugar, and a few drops of maraschino juice, not those godawful frozen things you get nowadays). The fishermen of Cojimar in front of the bust of Hemingway. In the middle, with hands in his pockets, is Pilar's captain, Gregorio Fuentes. Anyway, the story is that after Hemingway died, his fisherman friends decided they’d like to have this bust of the author made as a tribute. But times were tough and money was short. So they went around Cojímar and collected anchors, hooks, tools, propellers—anything that could be melted town and used for the bust. And here it is, with a lovely verdigris patina, facing the harbor. Well, it wasn’t the best version I’ve ever heard. But you’ve got to give the old guy credit for giving it a try. You can see the whole thing on the video above. I think the most humorous thing is when the dog in the background starts barking. At first I thought he was just barking at us but it becomes clear, as you’ll see, that he was either accompanying the old man’s singing or, more likely, protesting. Anyway, it’s quite funny. The 17th century fort at Cojimar. Photo by Nick Fletcher. In order to get through Finca La Vigía quickly, we decided to forego hiring an English-speaking guide and, instead, I led the tour. I was sure I knew as much as the guides since I’d been coming here for five years and, anyway, our experience with the guides was that while they were enthusiastic when talking about Hemingway and his family, they weren’t always accurate. For instance, for years our English-speaking guide (there was only one and we’d gotten her for three years straight) insisted that Hemingway did not commit suicide. Right. The wrong end of his Bass shotgun just happened to get stuck in his mouth one morning and of course the only thing to do about it was to try and free it by using your toes to pull both triggers. Who knew there were shotgun shells in the gun? Anyway, I told the boys, who were somewhat new to Ernest Hemingway, the most interesting stories about his time here in Cuba—how he chalked his weight up on the bathroom walls every morning; how he’d shot this massive male kudu in Africa and Mussolini heard about it and wanted the trophy, sending Hem a blank check, and Hem had sent the check back with a note on it saying “If you want a kudu, Mussolini, go shoot one yourself”; how Ava Gardner and Hem used to swim naked in the pool together. Afterwards, we piled back into the old beat-up Impala and headed down to Cojímar to have lunch at La Terraza. Greg hadn’t come to the Finca with us. Instead, he’d spent the morning at the Museo de la Revolucíon. His plan was to take a taxi to Cojímar and meet us for lunch around two. When we got to La Terraza he hadn’t arrived yet so we decided to walk around the town a bit. It was a very hot and humid day and what I was really thinking was that I wanted to go into the coolness of the La Terraza bar and have a cold Cristal but Hardy was set on showing the boys the sights of Cojímar, such as they are, so I went along with the program. We walked down to the dilapidated pier where Hemingway’s boat, Pilar, was often docked. There was a group of young boys and men fishing. We stopped and asked them if they were having any luck. They said not much. A small snapper, no bigger than six or seven inches, was lying in the sun on the concrete of the pier. I didn’t know if the fish was for eating or for bait. One of the boys leaned far out over the pier trying to look underneath it while another man held his feet. Perhaps, I thought, they were trying to catch crabs. In any case, the bay was obviously pretty much fished out. 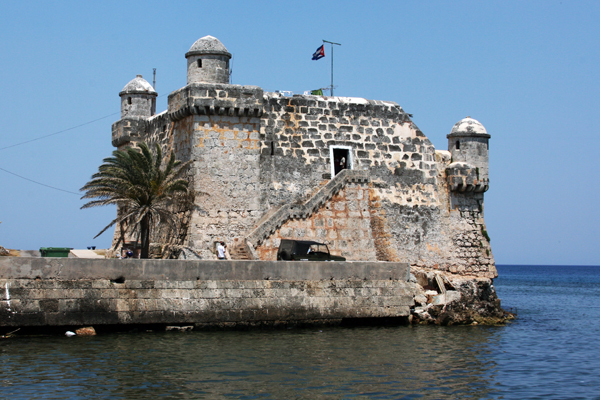 There is a 17th century stone fort at Cojímar that was built in 1645 as the easternmost defense point of Havana. These days it’s some sort of military garrison. There are signs as you approach the fort that tell you to not approach it, but Hardy decided they weren’t talking about him so he and Cam walked down the short road to the fort and started to climb the stairs. At the foot of the stairs was another sign saying in Spanish that this was a restricted zone and anyone going past this point was subject to arrest. Fletch translated the sign, yelling to Hardy and Cam as they continued going up the stairs. “You really want to go to prison in Cuba just because you want to have a look at an old fort?” Fletch said. Hardy stopped climbing. “I don’t think there’s anyone up there,” he said. “But what if there is?” Fletch said. Hardy thought about this for a moment and then hastily retreated, Cam right behind him. An old woman, sitting across the street beneath an umbrella, started laughing. We didn’t know if she was laughing because we were cowards for turning around or because we were fools for even approaching the fort. It seemed to me it was about the same anyway you looked at it. Best to leave the fort alone. Which is, fortunately, what we did since not two minutes later, a Cuban military Jeep pulled up to the fort and several soldiers hopped out and quickly ran up the stairs that Hardy had been climbing. I wonder what they would have done if they’d found him up there. Fortunately, we’ll never know.